We are not only thrilled that we have more than 25 rinks signed on to the STEM Program, but that the RSA and United Skates of America have negotiated a BRAND NEW payment plan for members! Effective immediately, United Skates of America's STEM Program will begin to allow RSA members to pay their STEM fee in 3 installment payments. The payment structure will consist of the 3 payments of 1/3 the total price. 1/3 upon signing the contract, 1/3 due 30 days from the contract sign date, and the final 1/3 to be paid on the 60th day of the contract date (30 days following the previous payment). Should you wish to pursue a different payment plan, please do not hesitate to call Jim McMahon, RSA Executive Director, at 317-347-2626 Ext. 104. Chanel Bellotto, owner of Skateworld in Lakeland, Florida, shares her experience in kicking off the USA STEM Program in this informative video from the RSA. To download the webinar on this program, click here. To view Part 2 of the STEM Program presentation at the 2015 Sk8 Expo Event, click here. How did the United Skates of America start the program? It started as a field trip program, like many rink owners utilized. United Skates of America had updated their field trip program, but never on a large scale. 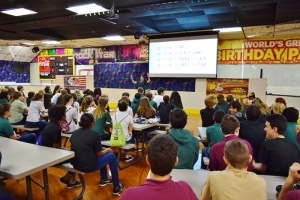 While on a trip to one of their roller skating facilities in Baltimore, M.D., Karen Palermo, President of United Skates of America, met with an educator named David who taught math with roller skating as part of an educational field trip to the rink. A little dismayed by the information lacking in the field trip program, he suggested altering the field trip to encompass the STEM curriculum. Being in the roller skating industry for more than a decade, her first response to the idea: What is STEM? He gave her a background on the program and she went back to the office and researched the program and how it was being integrated, shocked at how applicable STEM was to the roller skating industry. David was an engineering professor at a well-known college and decided to take on the first round of the STEM curriculum as it applied to roller skating, which ultimately still needed considerable work, according to the United Skates of America team. To get schools into the rink, Karen knew that it had to have an educational component, and the curriculum had to be impressive to the administration and the teachers in the schools. The United States is lagging so far behind in the world in science and math education that it has fallen to 27th in the world. As a result, the education system in the U.S. has taken on STEM in a nationwide push to advance our country in the hopes of turning out leaders in math and science industries. Future jobs will rely upon science, technology, engineering and math and at the current rate, the US will need at least 1 million more professionals with a math and science background over the next decade. If these numbers don’t improve, we will drop well below 27th in the world. The STEM program gets kids excited about math and science. Mike Hudoba, an educator of the roller skating STEM program and PhD candidate at Ohio State University said of the program, “I can always tell it was a successful program when I have a line of kids waiting to hug me before they leave.” Palermo champions the program for being the force behind changing children’s lives, “We are literally making an impact on these kids to think about and incorporate math and science in their future. That’s where the jobs are going to be.” And because there are so many STEM-based grant programs out there, schools can apply to grants for these field trips making it a win-win for everyone involved. No one wants to have their doors closed during the day. The USA STEM program will turn your rink into an educational learning facility for your area school system, but it also has the ability to draw in school districts from more than 80 miles away. New stream of revenue and profit for daytime operation from 9 a.m. – 1 p.m. or later. 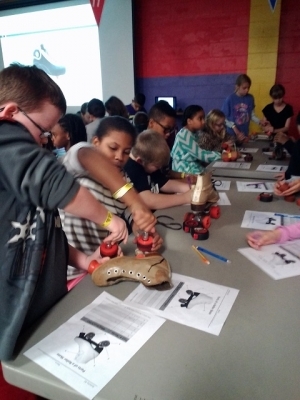 Daytime STEM field trips offer greater potential to create new skaters than evening fundraisers. 100% of students attend the field trip. During a fundraiser, there are many factors that contribute to students attending. Increases your prospect list by targeting every single teacher in every single grade level. Schools are willing to travel further to attend this educational experience. Current schools using the USA STEM program have traveled from as far as 1 ¼ hours away. 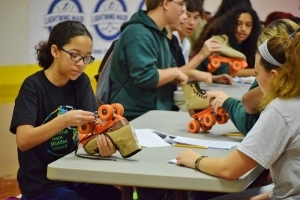 Schools support verified, STEM-based educational programs making the USA STEM program the only program of its kind in the roller skating industry. It has been tested in 17 different markets, many with Title One schools, and has been approved by numerous school districts which previously would never approve daytime field trips. What does a STEM Field Trip look like? The USA STEM program combines verified STEM education, physical education and lunch into an exciting format. This one hour lesson demonstrates the relationship between STEM curriculum and roller skating. Students learn these concepts in an interactive and entertaining way to enhance learning. 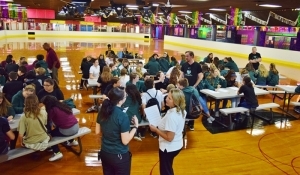 The STEM portion of this program is instructed by a trained, experienced educator, NOT A TEACHER, your rink will hire who is knowledgeable on STEM and roller skating. Energetic educators are a must! An introductory lesson on roller skating will teach all skill levels with a 10 minute lesson demonstrating the basics. Lunch will then be provided during the three hour period following the lesson plan and then they will skate for approximately 2 hours. The lessons take place in the mornings, Monday through Friday between 9:30 a.m. and 12:30 p.m. The best part? 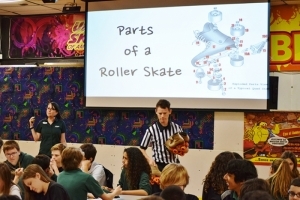 Lesson plans have been created for Grades K-12 that cover every aspect of roller skating and its relationship to STEM. The field trips are booked for a minimum of 60 students with up to 200 at a time. Schools normally book an entire grade level, which increases the number of prospects you have available to you by leaps and bounds. What are the most important components of STEM? First, lesson plans are key. The benefit of the USA STEM program is that there isn’t just one lesson for each grade level. Grades K-5 have 15 STEM lesson plans. Grades 6-8 have 6 STEM lesson plans. Grades 9-12 has one lesson plan. In addition, there are currently 17 more lesson plans in development. 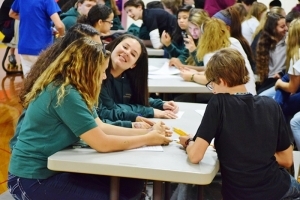 Offering various lesson plans on each facet of STEM in various areas allows teachers to choose the topic that best relates to what they’ll be discussing in their class for the year. 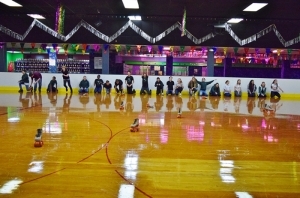 For large groups, music, math and roller skating is the perfect lesson plan. The highlight is that the curriculum is constantly improved and is done so with the state education requirements in mind. What is covered in a sample STEM lesson? What type of motion does each type of friction indicate? How does friction apply to roller skate wheels? The lesson plan then moves into activities that demonstrate the science and math behind friction. The topics don’t change from grade levels, but how they are taught and the level of depth changes with grades. A good educator should be able to teach complex subjects to all ages and have a passion to do so. What have been the financial results? Top performing facility: 85 STEM field trips with $102,000 in revenue for Year 1. Not included in this income is: The above results do not include revenue from vending, redemption or lockers, nor does it include all of the additional revenue from public skating, birthday parties, special events, etc. that were booked because of the new children that were introduced to roller skating. Those rinks that didn’t market it and reach out to schools didn’t do as well as others, so it’s important to remember that once you purchase this program and market it heavily, your success is based on your motivation and commitment to the program. It is also important to start as close to the beginning of the school year as possible, before all field trips are scheduled. NOW IS THE PERFECT TIME TO SELL STEM! What about package pricing for schools? Packages are set up in three different levels. 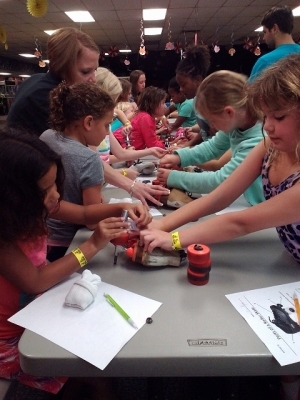 Basic, which includes admission, skate rental and STEM lesson. Deluxe includes everything from the basic package plus a slice of pizza and a drink. And the Super Package, which includes all of the deluxe items plus unlimited pizza and drinks. Most schools take the deluxe package and pricing will vary based on your rink and location. The STEM program changes the way your community sees your business. Instead of being a recreational facility, your business is now branding itself as a first class learning environment where kids can not only come to have fun, but also to be educated. Your business becomes more valuable to the community from day one with the STEM program. What’s included with the USA STEM program? The USA STEM program is a turnkey program, which means that they provide you with literally everything you need to take to your school system and start booking STEM field trips. The materials included are professionally designed and created with every level of rink owner in mind. The tools are easy to use and the step-by-step checklists show you how to go about launching the program in your area. An electronic database of all STEM materials will be available to licensees of the STEM program at www.usastemlibrary.com. Licensees will receive their own confidential username and password to be able to access the STEM materials at any time. Licensees will be provided with all of the information they need to hire a STEM educator who can educate children, as well as attend sales meetings with your sales manager; a complete equipment list of what you will need to make the program work; every single marketing tool, including commercials, flyers, highlight videos for teachers who wish to see more, and state standard example flyers which you can customize quickly and easily in Microsoft Word; STEM training videos and lesson plans; photos and images to use in your materials; confidentiality agreements for educators; STEM program operational instructions; videos to teach your own educators how to present the materials and much more. In addition, checklists of how to market the program show licensees exactly how to launch the program in their area. The STEM Program will also show you how to maintain your STEM school database of every single teacher in your area to ensure that you’re reaching the right people at any time, as well as how to utilize Facebook and email marketing, templates, and more to boost your STEM program sales. Those who license the USA STEM Program will receive complete support for the USA STEM program. Access to the web-based library system, 24/7 access to marketing and training materials, quarterly LIVE educator video/audio STEM training calls run by USA providing training on the programs, as well as visits to USA facilities to view STEM programs happening LIVE and to meet the USA management teams to answer any STEM questions on implementation. In addition, you will have access to top USA STEM educators to help you implement your STEM program and monthly regional video calls with the top STEM Sales Producer for sales training. Sign up is quick and easy. The RSA and the Roller Skating Foundation have paid for the rights to offer the program to RSA members. The cost associated with the program is minimal once you begin to realize the overall return on your investment. There is a one-time licensing fee based on facility volume and an annual renewal fee. To sign up to the program you must be an RSA Member. If you have questions or would like a pricing sheet, contact Lauren Fink, Regional Sales Manager for United Skates of America, at LFink@usa-skating.com or call 516-795-5474 Ext. 0. Lauren will help you with the contract, answer any questions you might have, and sign the form with you. Once signed by USA, you will complete the remaining confidential information and submit with payment to Tonya Crenshaw, RSA Accountant, at accounting@rollerskating.com or by fax to 317-347-2636 with payment information. If you have questions about payment methods, she can be reached at 317-347-2626 Ext. 111.